This report about PEEK for Telescopes in the combination tooth- and gum-colored is currently being built…. Die Ansicht von basal zeigt die Klebestellen im Detail. From the basal view to show the glue-connection. All parts have been milled instead of pressing and the results are much finer ! Another case about PEEK and implant-telescopes. from Dr.Rolf Vollmer, Dr.Martina Vollmer and ZTM Michael Anger. 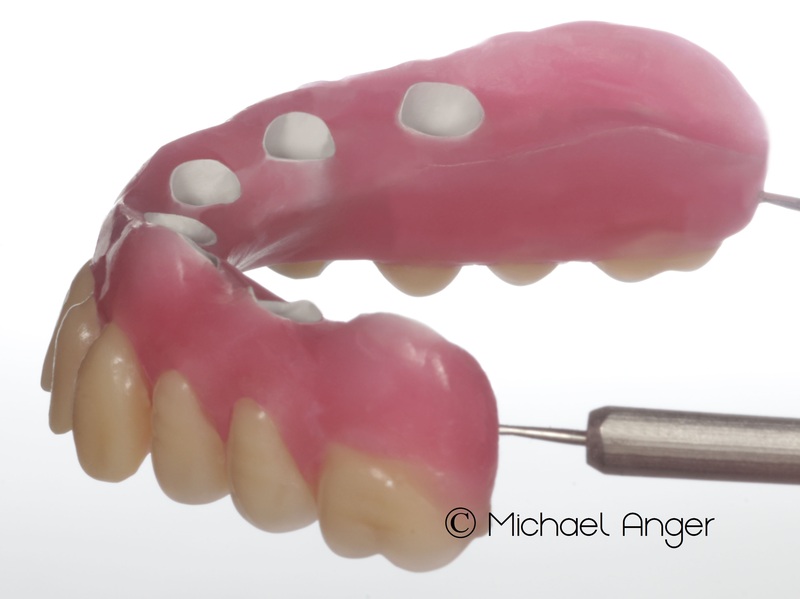 Full case study of the implantation through to completion. With practice-images and pictures from the dental laboratory. This article is growing step by step and is constantly expanding. The primary parts, made of burn-out plastic auxiliary parts. 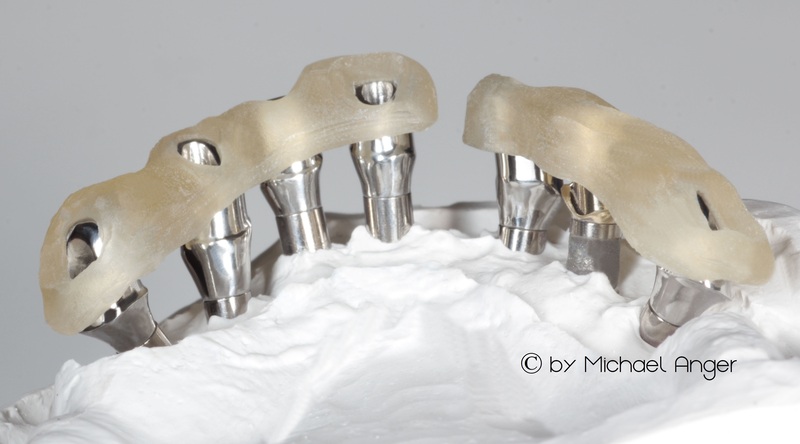 In Regio 24 a castable gold abutment had to be used because there was no other auxiliary parts were expired. PEEK-telescopes in white PEEK. 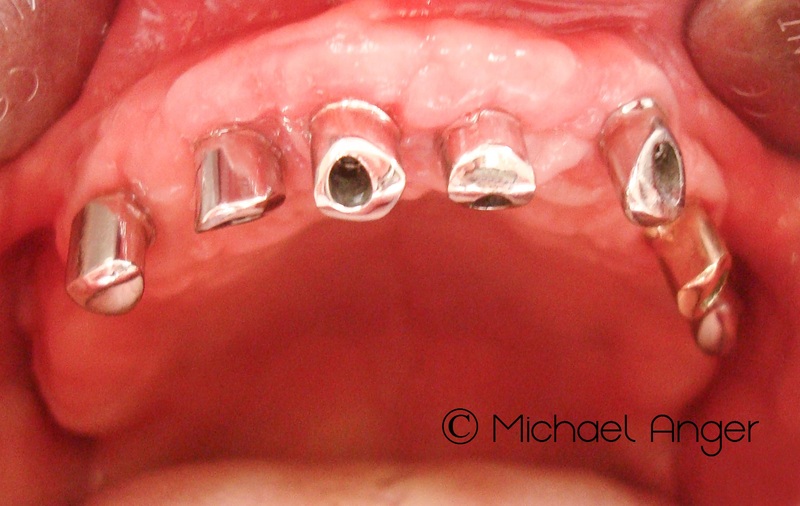 Here we see the secondary telescopic bridge directly after milling, without finishing. The secondary structure according to the development of basal. 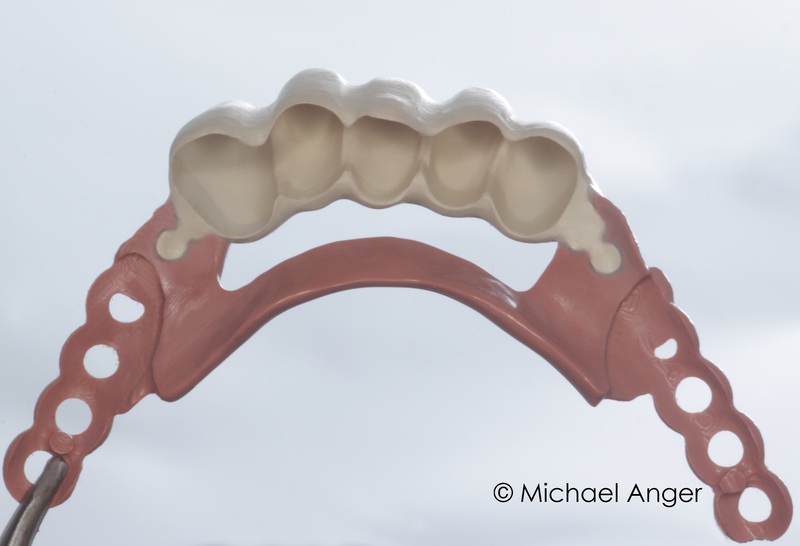 In palatal area a reinforcement was modeled to achieve a stronger rigidity of the framework . 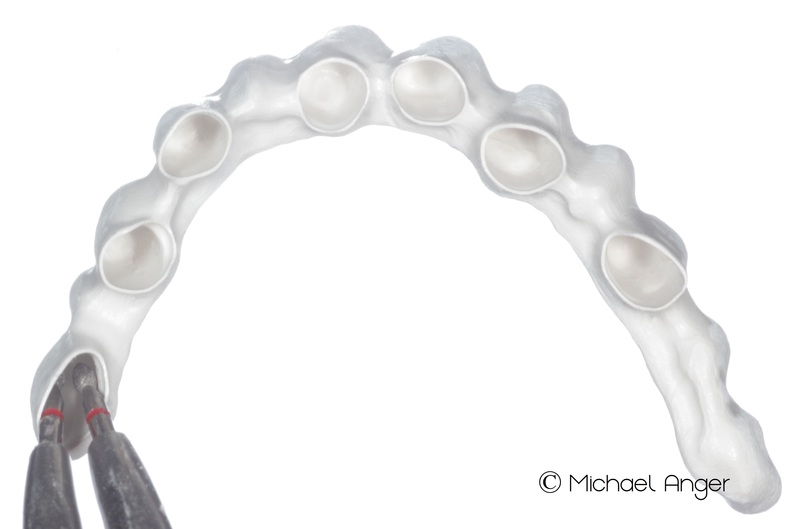 Drafted PEEK skeleton in the occlusal view. 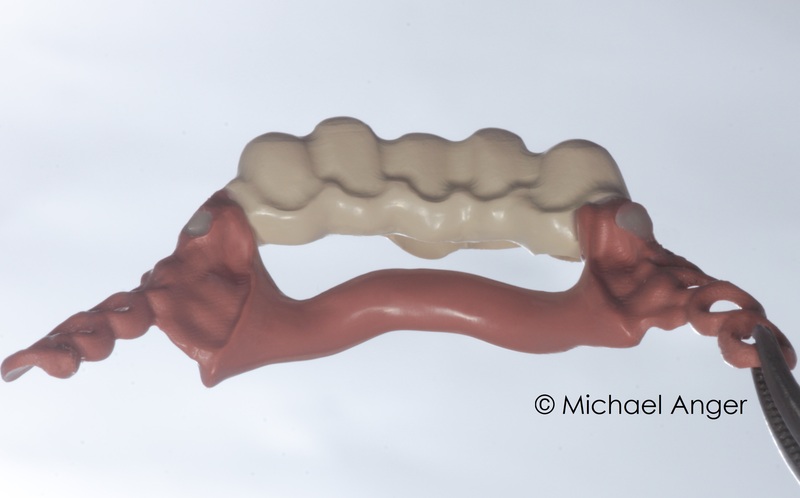 To support the plastic teeth was modeled anatomically. 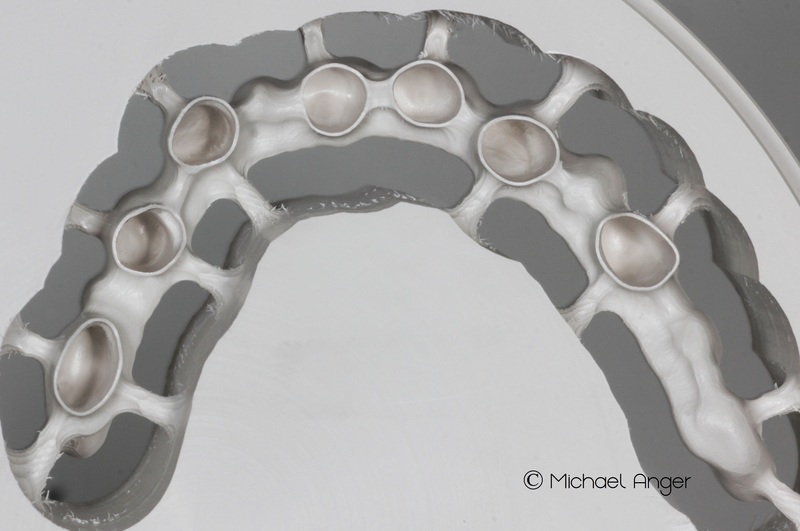 The placement of the secondary framework on the implant-supported primary telescopes. No other material slides when inserting so clean and soft as PEEK. 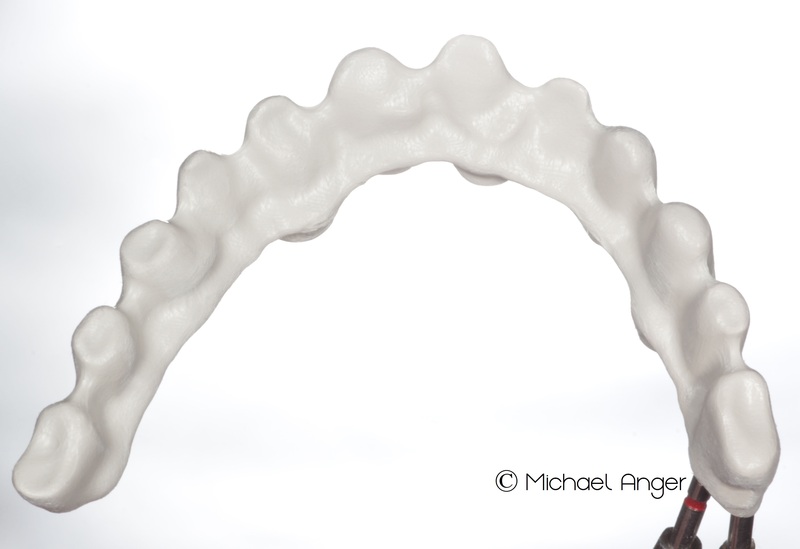 This soft glide outperforms galvano-technology far and is highly appreciated by clinicians and patients. This construction is very light and nevertheless highly stable. 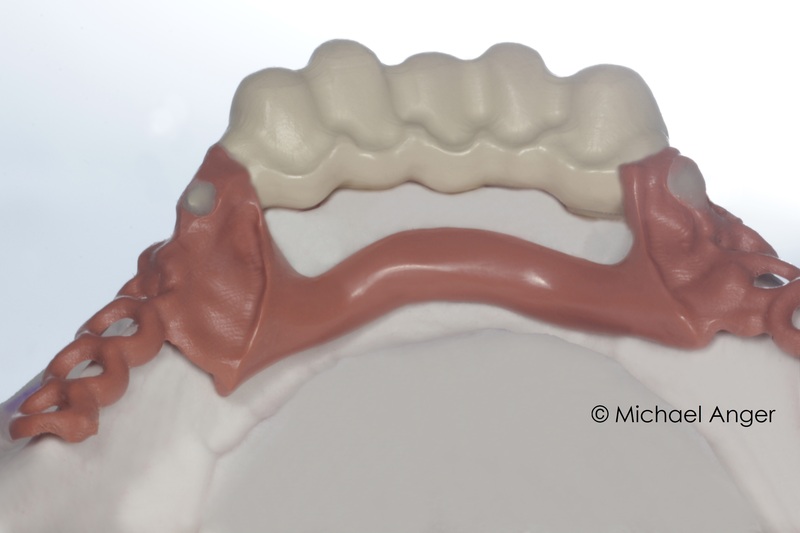 For the correct and safe transfer of the primary parts in the mouth, we provide plastic keys. 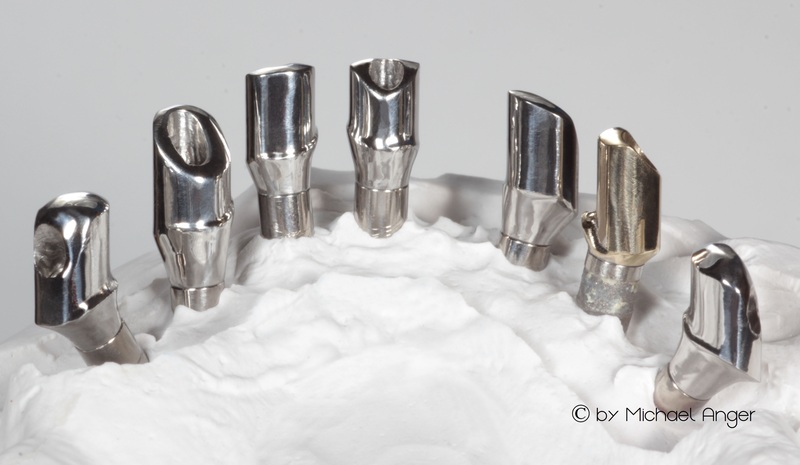 In different implant axes, these keys can only be used after insertion of the abutments. The primary telescopes during the fitting in their final position. 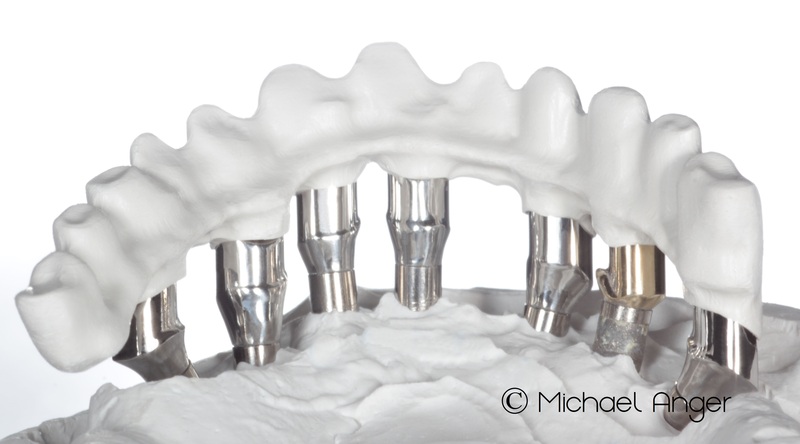 Due to the different implant-axis you can see the different passage points of the screw channels. 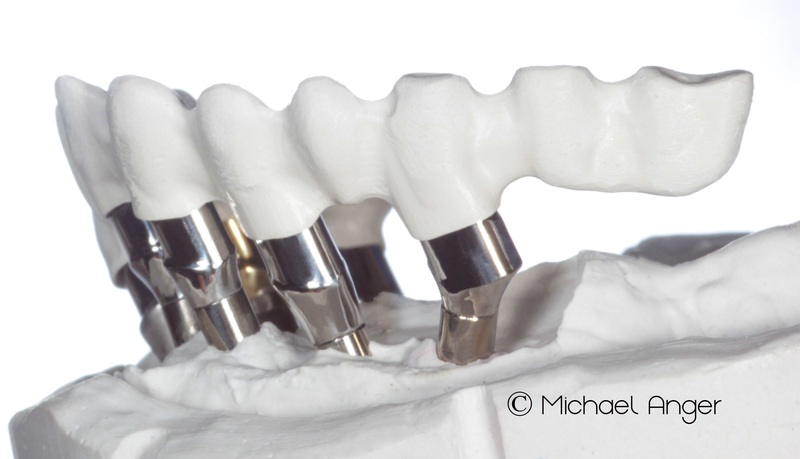 PEEK secondary telescopes as a telescopic bridge on implants in the palatal view in end position. Constructions in this material are very light (11g) and highly stable. 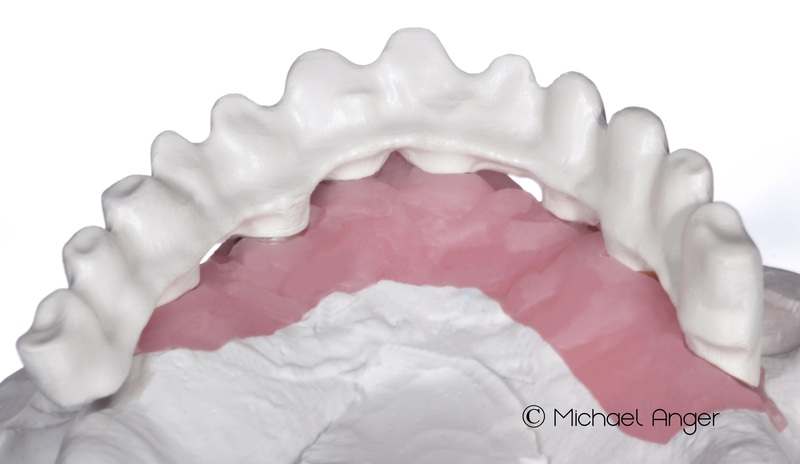 After the correct fit of the metal-free frame is achieved, we configure a wax try in. 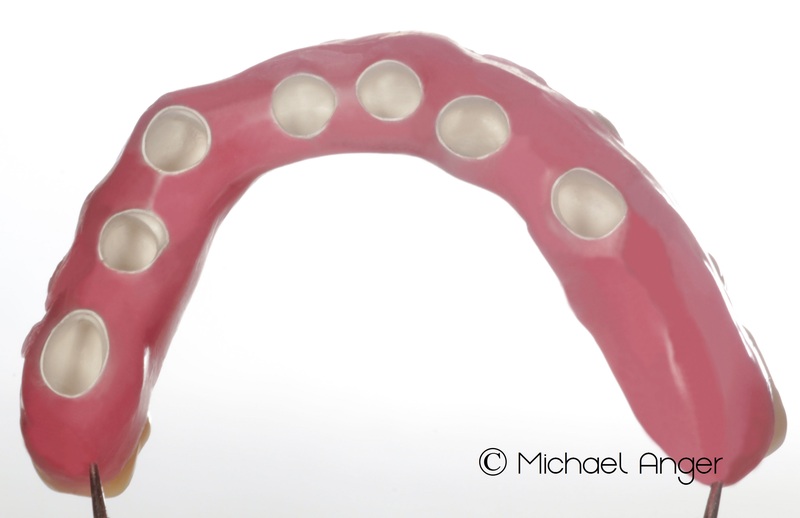 The acrylic teeth are placed to verify the aesthetics and the bite. 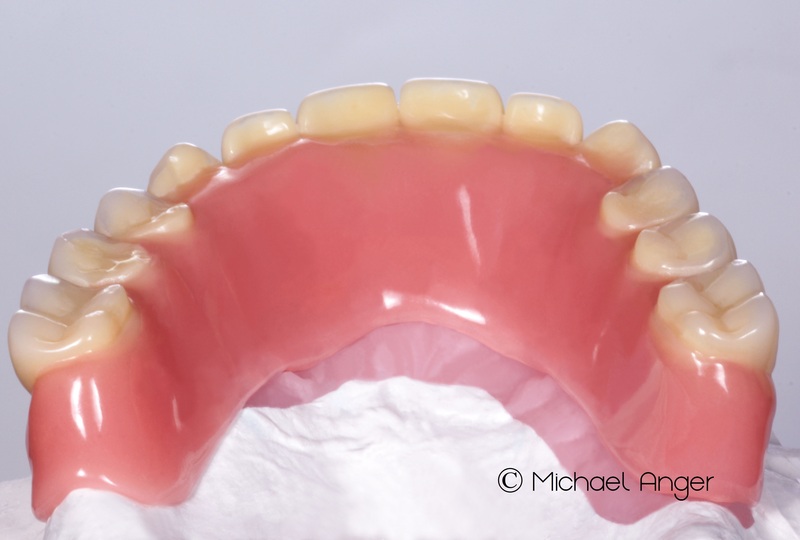 All prosthesis components are modeled with wax, to check the seat and also the fit at the gingival side. 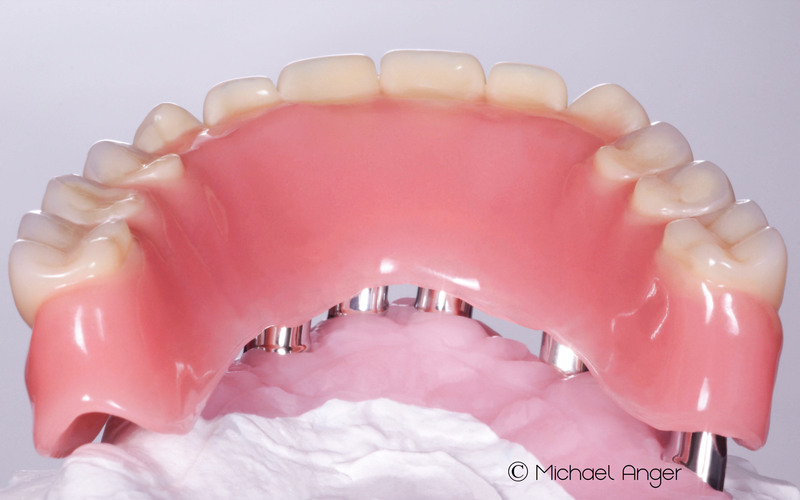 The prosthesis in the position of the first contact. The end position with a clean, tight closure.